Unlike the leaders of the former Soviet Union and Eastern Europe, Fidel Castro remains vehemently opposed to making a complete transition to a market economy. Thus far the Castro regime has chosen to implement both economic and political reforms incrementally, largely in response to worsening conditions. Many Cuban analysts believe these efforts are inadequate because they prolong popular suffering and serve only to temporarily delay economic collapse. There is a strong consensus that unless the Castro regime proceeds along the most direct path to a market economy, the Cuban economy is doomed to meander aimlessly. Even though the abandonment of socialist economic ideals seems inevitable, there exists a critical period of transition for Cuba. It is during this period that Castro’s decisions and their impact upon selected target variables can be assessed and the associated probabilities of economic direction charted. The future direction of the Cuban economy and the extent of its recovery may be ascertained by employing fundamental decision theory combined with Bayesian analytical methods. The purpose of this paper is to examine the potential for using a Bayesian approach to forecast the direction of the Cuban economy in the short (1-2 years) to medium (3-5 years) term. Much of the recent literature dedicated to Cuba’s “life after the Soviet Union” addresses strategies of economic reform and reconstruction or presents political and economic scenarios possible in the near term, whereupon possible future scenarios implicitly imply the direction of the Cuban economy. This study will explicitly determine the probabilities of Cuba sustaining a centrally planned economy or transitioning to a mixed or predominantly market economy based upon the conditional dependence of specific variables: foreign exchange earnings, import substitution, political control, economic reforms, integration into the international finance community, and the policies of international or regional actors. Armed with such probabilistic outcomes, a forecast of Cuba’s economic direction can be proposed given an observed sequence of relevant events. According to Adolf Lowe (1965), the aim of a socialist economy in transition is a terminal state (of nature) with an efficient use of resources and a higher rate of growth, and not necessarily the marketization and privatization of the economy. The terminal state is defined in terms of specified macroeconomic goals and institutional changes instrumental to their achievement. What remains to be determined is whether the envisioned institutional structure creates the necessary motivations to move the economy to the desired terminal state. Presented in the second section is a brief description of the decision environment within which Cuba’s economic decisions are most likely to be influenced. In the third section, the specifications of the Bayesian forecasts are defined in terms of the mutually exclusive and exhaustive states of nature and the analytical translation of select target variables into relevant events. The probabilistic calculation of Cuba’s economic direction is formalized by the forecast mechanics presented in fourth section. Finally, conclusions drawn from the forecasts and their implications regarding economic direction and recovery are presented. Contained within Appendix A is a numerical example using hierarchical inference to calculate the assigned probabilities of relevant events. An econometric approach, although feasible, may prove too complex and cumbersome in assessing a generalized sense of economic heading; considering the difficulty of establishing, mathematically, production functions without reliable data and the crisis mode in which the Cuban economy is currently operating. A time-series model, which extrapolates past economic trends into the future, usually occurs in cases where a large number of data points are available. A single-equation regression model attempts to explain the variable under study by a single, often time-dependent, function (linear or non-linear) of explanatory variables. Similarly, a multi-equation simulation model seeks to relate the explanatory variables, through a set of equations, not only to the variable under study, but to each other as well. All of these approaches requires a thorough understanding of the economic interrelationships and processes being studied, and consequently, the construction of such models may prove extremely difficult (Pindyck and Rubinfield 1976: xiv-xv). The dynamics of the Cuban economic crisis force a collateral reevaluation of the processes at work and thereby compound the necessary mathematical formulations. Pursuant to the obstacles expressed thus far, a Bayesian forecast appears to be an applicable, appealing alternative; even though no similar application of the methodology was discovered upon reviewing the literature. Bayes’ theorem provides a formal procedure for revising the probability assessments of hypotheses concerning a situation such that evidence upon which the revisions are based is (1) more systematically considered than it would be intuitively and (2) is given more weight than if it were intuitively aggregated and judged. Thus more information can be extracted from the available data because the technique allows each piece of evidence, whether central or marginal, to add its weight to the final assessment in a systematic way (Hunter, 1984). Bayesian analysis calls for all probability assessments to be subjective and therefore risks reflection of undue bias or genuine disagreement among analysts. Bayesian techniques seek to overcome these shortfalls by assigning a formal role to subjective (non-data) information, allowing the forecaster to evaluate the impact of such information on the conclusions via a sensitivity analysis. (4) quantitative linkages (conditional probabilities) are established between adjacent levels based upon existing knowledge or information and hierarchical inference, as dictated by the fundamental principles of decision theory; (5) lastly, as new events occur or evidence is received, the use of Bayes’ theorem leads to the revision of the original probabilities assigned. As a result of the Bayesian forecast, a graphical representation of the initial and revised probabilities of the hypotheses will be used to illustrate the overall trends of the Cuban economy as relevant events occur. In addition, a sensitivity analysis of the forecast will be performed by substituting high or low values into various probability assessments and re-calculating the hypotheses’ outcome probabilities, thereby providing a range and an idea of the relative sensitivities involved. The originally assigned probabilities can also be adjusted in response to changing political or economic events and the forecast revised to reflect other probabilistic scenarios. Examined in this section are the dominant political and economic environments that affect Cuba’s attempt at achieving the terminal state desired by Fidel Castro. The political environment under which turmoil and change exist in Cuba is defined by the leadership of Fidel Castro and his commitment to Cuban socialism despite civil discontent over decreasing levels of domestic consumption and social benefits. Influential to the short-to-medium term economic decisions undertaken by the Castro regime will be the perceived intensity, extent and duration of popular opposition, and the regime’s ability to suppress or appease. If the Castro regime is to remain in control, it must find ways to re-legitimize itself through economic recovery and political revitalization (Gonzalez and Ronfeldt 1994). The decisions made by the Castro regime in response to the current crisis have thus far focused on three economic areas: the major production sectors of the economy, foreign direct investment and the increasing significance of the black market. Key to any reequilibration, or recovery strategies within the intermediate term are the major sectors of the Cuban economy that are capable of earning hard currency or providing import substitutes. Similarly, the successful attraction of foreign direct investment could considerably factor into the output production matrix of the Cuban economy, particularly if it materializes as capital. The black market in Cuba yields both aggravation and reprieve to economic planners. The history of monetary dualism in Cuba as discussed by Sanguinetty (1994) seems to reveal a reoccurring theme, “…the development of the dollar-peso dualism followed…the need to finance government expeditures.” While the black market accelerates the dollarization of the Cuban economy and is contradictory to socialist political and economic aims, it also serves to alleviate some economic and social pressures. In addition, the black market sets the (un)official Cuban peso/dollar exchange rate. External Policies of International and Regional Actors. The analytical translation of these variables into relevant events (E1-E6) is discussed below. Cuban foreign exchange earnings are a direct calculation of the revenues generated by both the commodity and service sectors added to foreign direct investments. The earning potential of major Cuban exports such as sugar and nickel will depend not only on production output but also on world market prices, unless more favorable bilateral agreements materialize. Increased foreign direct investment in the form of joint ventures may partially compensate for the low world prices of Cuban commodities particularly if selected industries become more efficient and benefit from long-term capital. The most significant import substitution efforts undertaken by the Castro regime address energy and foodstuff self-sufficiency. The lack of energy inputs severely curtails the production output of Cuba’s most important industries. In addition, regularly scheduled electricity blackouts throughout the country serve as a daily reminder of the unabated crisis conditions. A significant discovery and refinement of Cuban oil reserves or the completion and successful operation of the Juraguá nuclear plant could lessen energy rationing restrictions. The satisfaction of consumer demand for foodstuffs represents a prominent catalyst of civil unrest. Should Cuba earn sufficient foreign exchange to purchase 30 to 40 percent of its foodstuffs abroad, and should import substitution meet 50 percent of domestic consumption, the remaining 20 to 10 percent could be absorbed by private production or the black market. Maintaining political control within Cuba involves the Castro regime being able to respond quickly and decisively to civil or military challenges. Central to this issue is the ability of the Castro regime to sustain its claim of legitimacy in the face of alternate claims from outside the regime. Black market activity may also provide information indicative of the potential for civil discontent or disobedience. Should staple consumer goods become increasingly scarce, even on the black market, the unofficial exchange rate (peso/ dollar) will rise, reflecting inflationary pressures. Inflation of black market prices left unchecked could ultimately result in desperate popular actions. According to Edlestein (1995), a socioeconomic structure must be created in which the social relations of production draw individual and sectoral short-term interests closer to the needs of long-term socialist development. The relevant economic policies include those affecting institutional structures, as well as internally and externally oriented policies (Alonso and Rathbone 1993: 19). The internal and external economic policies that result in less centralization include: liberalizing prices, privatizing state industry, instituting tax reform, adopting a realistic exchange rate, restructuring incentive policies, reducing state subsidies, and encouraging private enterprise. The tradeoff is a loss of state control over the allocation of resources and economic activity, from which income distribution inequalities result. Economic centralization, as stated by Edlestein, lacks the flexibility to adapt to changing conditions and technologies, and is inadequate to provide for continued growth under conditions of reincorporation into the global economy. A major obstacle thwarting the integration of Cuba into the global financial community is its inability to service a $11 billion debt owed to Western lenders. 3 The effect of Cuba paying its foreign debt is to reduce the foreign exchange available for imports and investments. For Cuba to cover interest and principal on its debt an increased trade surplus or a renegotiated repayment schedule is necessary. Cuba is not a member of the International Monetary Fund nor the World Bank and therefore is unable to secure desperately needed financial credits. Prospective lender-nations remain skeptical of Cuba’s economic and political future and are reluctant to extend credit other than in the form of investments in joint ventures, or “debt swap” deals as accomplished by Mexico. The “governance” criteria of Western aid donors, as identified by Betancourt (1994), include the legitimacy of government; accountability of political and official elements of the government; competence of governments to formulate policies and deliver services; and respect for human rights and rule of law. Should significant oil reserves be discovered in Cuba, access to financial credits could be considerably facilitated. The external foreign policies of international and regional actors such as the U.S., EU, OAS, and CARICOM could quite literally throw Cuba a lifeline. Such action could entail development aid similar to that pledged to the economic reconstruction of Haiti following the return of exiled president JeanBertrand Aristide in mid-October 1994. The most debated foreign policy issue remains the lifting of the U.S. trade embargo, which undoubtedly would increase foreign investment but not necessarily eliminate tension between the two countries, considering the $1.8 billion in expropriated properties claimed by American businesses and the $7 billion claimed by Cuban exiles. According to Sanguinetty (1994), given the size of Cuban markets, the state of current technologies, and the economies of scale, Cuba’s growth prospects are dependent on its ability to export. The efficacy of the Helms-Burton Act is yet to be determined in its totality. Debate regarding any legally binding interpretation under the General Agreement on Tariffs and Trade (GATT), by such agencies as the World Trade Organization (WTO), and the economic policy reaction or retaliation by Cuba’s major trade partners remain unresolved. The scenario forecasts assume the continuation of Fidel Castro in a position of unchallenged political and economic leadership into at least the medium term (5-8 years). Under the first five scenarios, U.S. policy toward normalizing relations with Cuba and lifting the embargo remains unchanged, as does Cuba’s indefinite moratorium on the servicing of its foreign debt. Under these conditions, Event 5 and Event 6 can be excluded from Scenarios I-V. A word of caution is necessary with respect to the specific time order of relevant events. If no specific time order can be specified for the events under consideration, different orders will represent different composite events and one should expect to calculate different final products for the different probability judgments assigned (Hunter 1984: 168). Event 1 through Event 6 have been placed in a logical order of succession without regard for the discrete time intervals between successive events. Event 1 through Event 4 are interchangeable; however, Event 5 and Event 6 most likely would succeed Event 1 through Event 4 regardless of their order. All assigned probabilities are subjective, and are intended to appeal to the prescience of the reader. Due to the initial definition of Event 4, the conditional probability, P(E4|H1), is assigned a low value and factors to significantly decrease P(CPE) regardless of the sequence of relevant events. For this study Event 4 is considered an applicable variable to the direction of the Cuban economy, and therefore has been included in each scenario. Scenario I reflects the limitations of a Cuban CPE with respect to earning foreign exchange receipts in excess of $4 billion; considerably more favorable conditions exist under a mixed or market economy. The sequence of events is ordered E1-E2-E3-E4. Table 1A lists the prior probability of each hypothesis, the conditional probabilities associated with the sequence of events, and the revised probabilities calculated after the sequence has occurred. The generalized trends of the Cuban economy subsequent to the given sequence of relevant events for Scenario I are depicted in Figure 1. As each relevant event occurs the probability of each hypothesis (CPE, MIX, MKT) is recalculated (revised) using Bayes’ theorem. These results are listed in Table 1B, and correspond to data points which determine the revised probability graph in Figure 1. Under the conditions of Scenario I the assigned probability of each hypothesis was affected by the associated sequence of events as follows: P(CPE) decreased by 99.1%; P(MIX) decreased by 8%; and P(MKT) increased by 167%. Scenario II considers the same pretense as in Scenario I, but instead assumes the events occur in reverse order. 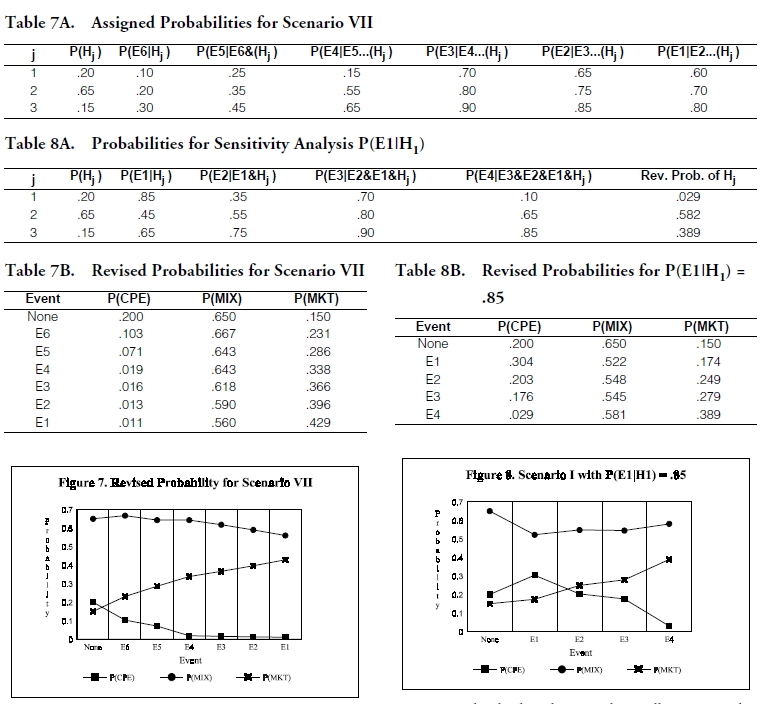 Similar to the previous case, Table 2A lists the prior probability of each hypothesis, the conditional probabilities associated with the sequence of events, and the revised probabilities calculated after the sequence has occurred. The generalized trends of the Cuban economy subsequent to the given sequence of relevant events for Scenario II are shown in Figure 2. 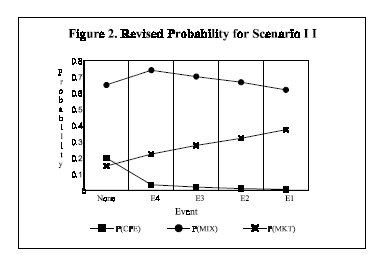 As before, the revised probabilities associated with the occurrence of each relevant event have been calculated and appear in Table 2B. Under the hypothetical conditions of Scenario II: P(CPE) decreased by 97%; P(MIX) decreased by 4.6%; and P(MKT) increased by 149%. Scenario III considers the conditions under which both political control and decentralization are less likely to occur coincident with a CPE. Under this scenario the Cuban government would fail to provide the most basic foodstuffs or no longer guarantee the social gains of the revolution. As a result, civil opposition would increase its demands for more market reforms and less centralization. The sequence of relevant events is ordered E3-E4-E2-E1. The generalized trends of the Cuban economy subsequent to the given sequence of relevant events for Scenario III are depicted in Figure 3. The revised probabilities associated with the occurrence of each relevant event appear in Table 3B. Under the hypothetical conditions of Scenario III: P(CPE) decreased by 91%; P(MIX) decreased by 19.7%; and P(MKT) increased by 207%. Scenario IV reflects the condition under which import substitution efforts to meet 50 percent of consumption needs are not likely to succeed in the near term regardless of the economic system in place. Table 4A lists the prior probability of each hypothesis, the conditional probabilities associated with the sequence of events, and the revised probabilities calculated after the sequence has occurred. The generalized trends of the Cuban economy subsequent to the given sequence of relevant events for Scenario IV are depicted in Figure 4. The revised probabilities associated with the occurrence of each relevant event appear in Table 4B. Under the hypothetical conditions of Scenario IV: P(CPE) decreased by 99%; P(MIX) decreased by 16.5%; and P(MKT) increased by 203%. Scenario V assumes that each of the three hypotheses has an equal probability of occurring, i.e., P(CPE) = P(MIX) = P(MKT) = 0.333. Such an equiprobable occurrence is most unlikely in the case of Cuba, however, it will be examined to illustrate an initial lack of information or intuition. The condition represents an assessor’s judgment that the situation is independent of the probabilistic outcome of each economic system prior to the sequence of relevant events. The remaining assigned probabilities are identical to Scenario I as is the sequence of relevant events, which is ordered E1-E2-E3-E4. Listed in Table 5A are the prior, conditional, and revised probabilities. The generalized trends of the Cuban economy subsequent to the relevant events for Scenario V appear in Figure 5. 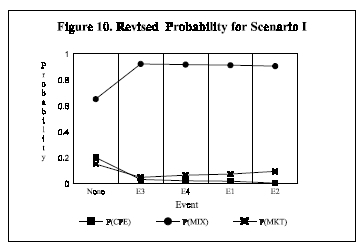 The revised probabilities associated with the occurrence of each relevant event appear in Table 5B. Under the hypothetical conditions of Scenario V: P(CPE) decreased by 99.4%; P(MIX) decreased by 23.1%; and P(MKT) increased by 122.8%. Scenario VI is identical to Scenario I, with the additions of Event 5 and Event 6. This scenario incorporates the conditions that allow for Cuba’s foreign debt to come under control and the external trade policies of other nations and organizations to significantly benefit Cuba; neither is expected in the near term. Such a situation could arise as the Cuban economy displayed signs of sustainable growth. Global perceptions of political and economic risk would be replaced by estimates of expected recovery. The sequence of relevant events is, ordered E1-E2-E3-E4E5-E6. Table 6A lists the prior probability of each hypothesis, and the associated conditional probabilities. The generalized trends of the Cuban economy subsequent to the relevant events for Scenario VI appear in Figure 6. The revised probabilities associated with the occurrence of each relevant event appear in Table 6B. Under the hypothetical conditions of Scenario VI: P(CPE) decreased by 99.6%; P(MIX) decreased by 28.4%; and P(MKT) increased by 255.7%. Scenario VII considers the same pretense as Scenario VI, but instead assumes the events occur in reverse order. This scenario represents a concerted effort by the international financial community and other nations and organizations to actively perpetuate the economic recovery of Cuba. In essence, an economic lifeline would be thrown to the Castro regime. The likelihood of such a coordinated effort prior to any major economic reforms within Cuba is low. Table 7A lists the prior probability of each hypothesis, and the associated conditional probabilities. The generalized trends of the Cuban economy subsequent to the relevant events for Scenario VII appear in Figure 7. The revised probabilities associated with the occurrence of each relevant event appear in Table 7B. Under the hypothetical conditions of Scenario VI: P(CPE) decreased by 94.5%; P(MIX) decreased by 13.8%; and P(MKT) increased by 186%. Before interpreting the scenario forecasts and formulating any conclusions, the probability assessments require a sensitivity analysis. In each of the scenarios the foreign exchange earning potential of a centrally planned economy was assessed to be significantly lower than that of a mixed or predominantly market economy. To demonstrate the sensitivity of a forecast to the earning potential of a CPE, a value higher than conditionally warranted is used to calculate a new set of revised probabilities. Consider Scenario I with the condition that the occurrence of Cuban foreign exchange earnings exceeding $4 billion is, by contrast, most probable under a CPE. How is the forecast of Scenario I affected if all other conditional probabilities are unchanged? Listed in Table 8A are the assigned prior, and conditional probabilities, with the value for P(E1|H1) appearing in bold italics. The revised probabilities associated with the occurrence of each relevant event have been recalculated and appear in Table 8B. 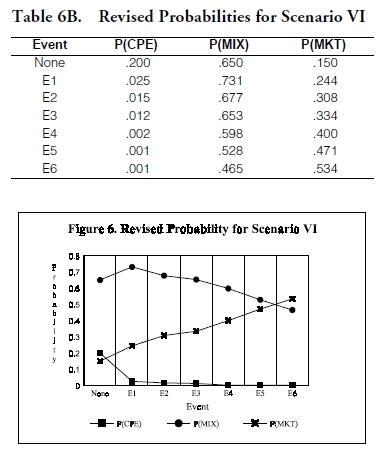 The sensitivity of the Scenario I forecast to the conditional probability, P(E1|H1) = .85, is evident upon examining the revised probabilities of a CPE in Table 8B up to the occurrence of Event 3 and comparing them with corresponding values for P(CPE) listed in Table 1A. With the condition that P(E1|H1) = .85, P(CPE) decreases by only 12% after Event 3 has occurred, compared to a decrease of 93.8% calculated for Scenario I. The revised generalized trends of the Cuban economy subsequent to the given sequence of relevant events for Scenario I with P(E1|H1) = .85 are depicted in Figure 8. The current economic situation in Cuba precludes the justification for assigning the occurrence of a Cuban CPE earning foreign exchange in excess of $4 billion a high probability. Despite the sensitivity at high values of P(E1|H1), an assigned probability ranging from .05-.65 will not significantly influence a scenario forecast. The sensitivity of a forecast to the conditional probability of political control, P(E3|H1), is analyzed similar to the case of P(E1|H1). The ability of the Cuban government to maintain political control under a centrally planned economy is now assessed to be higher than under a mixed or predominantly market economy. This condition alone is sufficient to influence P(MKT), but when combined with an increased conditional probability for P(E1|H1) it significantly affects P(CPE) as well. Scenario III is chosen for this example, and a new set of revised probabilities calculated. Table 9A lists the associated probabilities, with the amended values for P(E3|H1), P(E3|H3) and P(E1|E4&E3&H1) appearing in bold italics. The revised probabilities have been recalculated and appear below in Table 9B. The sensitivity of the Scenario III forecast to P(E3|H1) and P(E3|H3), given a high value for P(E1|H1), is determined by contrasting the values for P(MKT) and P(CPE) listed in Table 3A with the new set of revised probabilities. Under the above conditions, P(MKT) increases by 74.7%, and P(CPE) decreases by only 28% after the relevant events occur, this compared to a P(MKT) increase of 207% and a P(CPE) decrease of 91% calculated for Scenario III. The revised generalized trends of the Cuban economy subsequent to the relevant events for Scenario III with P(E3|H1) = .80, P(E3|H3) = .40 and P(E1|E4&E3&H1) = .85 are depicted in Figure 9. The Cuban state security apparatus poses a portentous force to any civil opposition. However, as the economic crisis worsens increased repression of civil unrest will undoubtedly reach a threshold beyond which its effectiveness will be minimal. Arguably in the case of Cuba, definite political control is seen to be jeopardized by the adoption of free market mechanisms, as lesser economic controls could intensify a concurrent appetite of organized opposition for more political freedoms. Ascribing high values to P(E3|H1) in the near term cannot be readily justified, and the sensitivity of a scenario forecast assigned such a conditional probability exceeding 0.60 will prove significant. with the value for P(E1|H3) in bold italics. The revised probabilities have been recalculated and appear below in Table 10B. 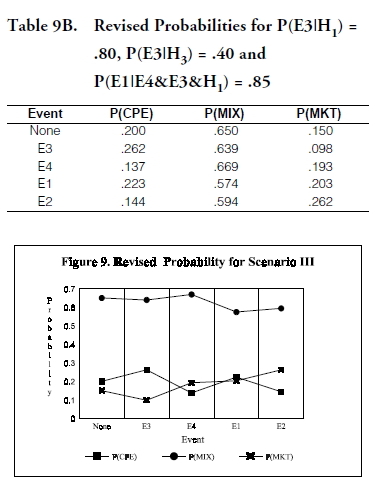 The sensitivity of the Scenario I forecast to a low value of P(E1|H3), is analyzed upon comparing the values for P(MKT) and P(CPE) listed in Table 1B with the new set of revised probabilities in Table 10B. and P(E1|H2) does not accurately reflect the foreign exchange earning potential of a predominantly market economy. Associating a relatively higher conditional probability to P(E1|H3) is justified, given the historic inefficiencies of Cuba’s CPE and the limited number of autonomous export earning enterprises expected to operate in a mixed Cuban economy. To overcome forecast sensitivity at low values of P(E1|H3), its assigned conditional probability should be greater than 0.55 or the difference between P(E1|H3) and both P(E1|H2) and P(E1|H1) at least 0.20. Sensitivity analysis may also confirm if a scenario forecast is influenced by overly optimistic or pessimistic probability judgments of a particular event. Consider Scenario I with the condition that Cuban foreign exchange earnings exceeding $4 billion are considerably less probable under each of the hypotheses: CPE, MIX, and MKT. In this example lower assigned values of P(E1|Hj), j = 1,2,3; define a pessimistic assessment of Event 1. Table 11A lists the assigned prior, conditional and revised probabilities, with the affected values for P(E1|Hj) shown in bold italics. The revised probabilities have been recalculated and appear below in Table 11B. 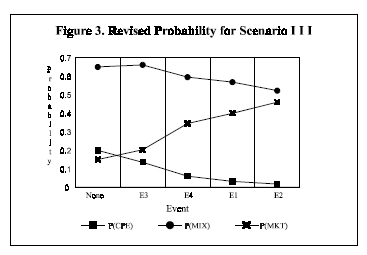 For the sake of argument the original conditional probabilities listed in Table 1A are considered an optimistic assessment of Event 1. Under the optimistic condition, P(CPE) decreased 99%, P(MIX) decreased 8% and P(MKT) increased by 167%. The revised forecast, incorporating the pessimistic probabilities, resulted in P(CPE) decreasing 96%, P(MIX) decreasing 11.5% and P(MKT) increasing by 178%. The economic trends of Scenario I with a pessimistic assessment of Event 1 appear in Figure 11. As this example illustrates, sensitivity analysis can be extended to establish the sensitivity of a forecast to the “pessimistic/optimistic” assessment of a particular event. All assigned conditional probabilities specific to the event must be re-evaluated before proceeding with any analysis of the revised probabilities. 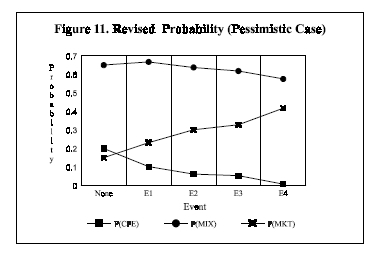 For Scenario I, a pessimistic assessment of E1 results in a revised probability over four times higher than calculated in the optimistic case for P(CPE) after each event occurs. The revised probabilities calculated after the occurrence of the final event, however, do not appear significantly influenced by the quantification of a pessimistic assessment. The forecast results of Scenario I reveal a sharp increase (62.7%) in P(MKT) coinciding with a sharper decline (87.5%) in P(CPE) after Cuban foreign exchange earnings exceed $4 billion. As subsequent events occur both P(MKT) and P(CPE) continue to increase and decrease respectively, but at a much less pronounced rate. The differences between the systemic attributes of a CPE and MKT directly affect their capacity to achieve the necessary conditions for Event 1. It is this disparity that accounts for the dramatic divergence between P(MKT) and P(CPE) in Scenario I. The probability associated with a mixed economy, P(MIX), exhibits a steady decline of only 3%-8% after a modest initial increase of 12.4%. Overall, the probabilistic estimate of Cuba’s economic direction under the conditions for Scenario I suggests a steady convergence towards a 60%-40% split between P(MIX) and P(MKT) after the sequence of relevant events occurs. The forecast results of Scenario II essentially parallel those of Scenario I, with P(MKT) demonstrating a slightly lower rate of increase. The most recent political and economic events in Cuba more closely resemble the sequence assumed under Scenario II, however, the revised probabilities calculated for both forecasts are approximately the same. The forecast results of Scenario III reveal a large displacement for both P(MKT) and P(CPE) after the occurrence of Event 4. The revised probability for a MKT increases by 69.4% while the revised probability of a CPE decreases by 55.1%. The probability associated with a MIX exhibits a steady decline of 4%10% after an initial increase of only 1.7%. The facility of implementing economic reforms resulting in less centralization under a MKT versus a CPE explains the divergence. Such reforms represent a compromise by the Castro regime to counter increased civil unrest and preserve political control. Of the seven scenarios analyzed, the forecast results of Scenario III offer the closest approximation to a 50%-50% assessment of P(MKT) versus P(MIX). 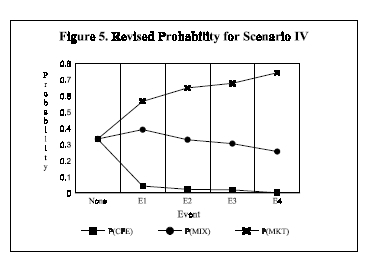 The forecast results of Scenario IV are similar to those of Scenario III, displaying the most significant probability shift after the occurrence of Event 4. In this case, however, marked convergence is evident between P(MKT) and P(MIX). The revised probability for a MKT increases by 45.2% while the revised probability of a MIX decreases by 17.0%, closing the previous gap between the two by 57.2%. The revised probability associated with a CPE exhibits an initial decrease of 94.5%, reflecting its inability to meet import substitution levels descriptive of Event 2. The forecast results of Scenario IV approximate those of Scenario III since the scarcity of basic commodities necessary for daily survival in Cuba could spark the civil disobedience and unrest examined under Scenario III. 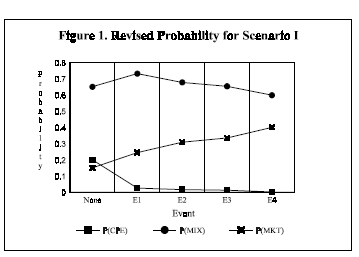 The forecast results of Scenario V consider equal probability of the three hypotheses: CPE. MIX, MKT. The revised probabilities immediately diverge from one another with P(MIX) experiencing the least change after the sequence of events has occurred, ultimately resulting in an approximate 74%-26% split between P(MKT) and P(MIX). The dominance of P(MKT) after the sequence of events has occurred is not unexpected since the conditions most favorable to each event is optimum under a predominantly market economy. The forecast results of Scenario VI postulate Cuba’s economic direction in the medium term. The revised probabilities portray an extension of the converging economic trends examined under Scenario I. Importantly, the revised probabilities of P(MKT) and P(MIX) cross and separate after Event 5, but before the occurrence of Event 6. It is at this point that P(MKT) overtakes P(MIX) suggesting the likelihood of Cuba integrating into the global economy as a predominantly market economy given Events 1 through 6 have transpired. Similar to the analogy drawn between Scenarios I and II, the forecast results of Scenario VII parallel those of Scenario VI. 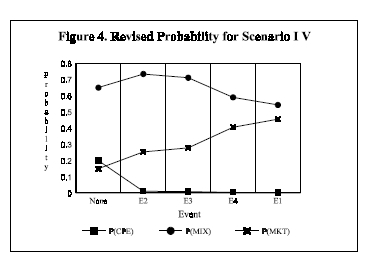 The revised probabilities of Scenario VII depict steady convergence between P(MKT) and P(MIX). The probability of a mixed economy, however, remains approximately 13 percentage points higher than the probability of a predominantly market economy after the sequence of events has occurred. Upon initial observation, the forecast results of Scenarios VI and VII lend some support to principals advocating the continued imposition of the U.S. trade embargo against Cuba as a means to bring about a free market economy there. The inferences will not be pursued and are beyond the scope of this study. The conditions guiding Cuba’s economic direction are dominated by the Cuban socialist experience, the supremacy of Fidel Castro, and the stark isolation which confronts the Cuban economy. The course taken by the Cuban economy in the near term is conditionally dependent upon reform measures directed at preserving the two former conditions and resolving the third. It is this conditional dependence that lends itself to a Bayesian formulation of possible scenarios and a forecast indicative of economic direction. The examination of each scenario forecast reveals probabilistic outcomes subsequent to a specific sequence of events deemed relevant to Cuba’s economic future. The juxtaposition of the event order represents varying combinations of both economic and political priorities critically challenging the Castro regime. Whether taken individually or compositely the scenario forecasts suggest either a mixed economy or a predominantly market economy as the most probable path given the economic challenges ahead. The perpetuation or resurrection of a centrally planned economy by the Castro regime does not seem practical or probable if economic rationality prevails. As postulated, the scenario forecasts presented in Section V do not explicitly determine the probability of Cuba’s economic recovery in absolute terms. Inferred from the Bayesian data analysis is the probabilistic response of three hypothetical outcomes to a set of conditions that may occur along a path to economic recovery. The construction of a Bayesian forecast requires the subjective definition of relevant conditional probabilities, which determine the revised probability of an outcome given that an event or sequence of events has already happened. As defined, Events 1 through 6 establish a conceivable set of occurrences marking a path for Cuba’s economic recovery. The prescribed sequence of events generating each scenario is a simple permutation of the event set, whose intent is not to exclusively characterize all possible paths, but to allow for analytical balance. The scenario forecasts calculate the revised probabilities of each possible outcome (CPE, MIX, MKT), and therefore can be interpreted as an updated estimate of outcome consequential to Cuba’s incremental progress towards favorable economic conditions and recovery. The economic recovery of Cuba is contingent upon more than the occurrence of Events 1 through 6 in any particular order. Other target variables such as measured economic growth rates, and monetary and fiscal policy reforms are also principal factors to consider. A lack of information, however, will complicate the translation of these variables into relevant events and make the subjective probability assignments increasingly more difficult. For example, there may be a time lag between economic successes and the actual measured economic growth where essential data has yet to be compiled. Cuba’s economic recovery presents a slightly different problem from estimating the future direction of the Cuban economy. Resolution of either conundrum reveals their conditional dependence and requires caution to preclude or identify events prejudicial to a particular outcome or economic strategy. Events 1 through 6 are justifiable since a different sequence of events less skewed towards market reforms, does not accurately portray the events, initiatives and debates currently taking place in Cuba. Deduced from the scenario forecasts, Cuba may indeed muddle through with a mixed economy, but to advance the conditions most favorable for economic recovery will warrant a predominantly market economy. Bayesian forecasting proves to be an acceptable method by which to explicitly determine the probabilistic outcomes of the Cuban economy given the occurrence of a single event or a sequence of relevant events. The strength of the analysis lies in the flexibility afforded to the forecaster to readjust assigned probabilities as the political and economic currents shift in Cuba. To incorporate the postulations of a different sequence of relevant events or additional events, congruent with the dynamics of the Cuban crisis, the forecaster need only formalize the associated conditional probabilities. The forecast results, derived from the deductive vice inductive judgments of the information or evidence available at the time, in essence assign a degree of precision to the uncertainty of Cuba’s economic future. A sensitivity analysis finalizes the Bayesian forecast of the Cuban economy identifying subjective conditional probabilities that will considerably affect the scenario forecasts should their values vary significantly. The sensitivity analysis also provides the means by which to compare Cuba’s pessimistic, optimistic, and realistic case scenarios. A Bayesian forecast of the Cuban economy is not without its shortcomings. Essential to the analysis is a clear definition of the relevant events whose translations, from key target variables, risk idiosyncratic or situational bias. Such prejudice may be unavoidable if complete information is unavailable or existing information suspect. In addition, to expand the possible Cuban economic hypotheses beyond 3-5 mutually exclusive hybrid classifications would require extensive probability computations, most likely aided by a computer algorithm. The following is an example of how hierarchical inference is used to calculate the assigned probability of a relevant event. Problem: How to incorporate the available data on Cuban nickel production and world market prices into the calculation of the assigned probability of Cuban foreign exchange earnings exceeding $4 billion (Event 1) for a predominantly market economy (MKT), under the conditions of Scenario VII . Solution: The sequence of events for Scenario VII occur in the following order: E6-E5-E4-E3-E2-E1, and when combined with the hypothesis of a market economy represent the most favorable conditions for Cuban nickel production. The data presented in Table 1 is extracted from the CIA Trade Statistics for Cuba 1993. From these data it is assumed that export earnings from sugar, tourism, nickel, tobacco, and citrus account for 91 percent of the total. Event 1 stipulates that foreign exchange earnings exceed $4 billion, which implies that: ($4 bn) x (.91) = $3.64 bn must be earned by Cuba’s major export oriented sectors listed in Table 1. A tabular array of assigned probabilities is constructed, which includes the revised probabilities calculated using Bayes’ theorem. The results are shown in Table 2, with the negation of sub-event e3 (nickel export earnings are less than $0.285 bn) denoted by ê3. From the data presented in Table 2 it is clear that the probability of Cuban nickel earnings exceeding $0.285 bn has increased to 64% (from 30%) given that output production is in excess of 45 thousand metric tons and the world price for nickel is greater than $6400 per metric ton. This revised probability now becomes an assigned probability which is combined with those associated with the other sub events, and Bayes’ theorem is again applied to determine the revised probability of Event 1. The results appear in Table 3, with the negation of Event 1 denoted by Ê1. The probability for E1 given that all the sub-events, e1…e5, have occurred has been revised to .80 as shown above. As the final step in the hierarchical inference process, this value is incorporated into the assigned probabilities of Scenario VII. It appears as P(E1|E2&…&E6&H3) in the seventh column, third row of Table 7A. Alonso, José F. and John Paul Rathbone. 1993. Panel Discussion: “Current Political and Economic Trends in Cuba.” In Cuba in Transition—Volume 3. Washington: Association for the Study of the Cuban Economy. Barclay, Scott, Rex V. Brown, Clinton W. Kelly III, Cameron R. Peterson, Lawrence D. Phillips, and Judith Selvidge. 1977. Handbook for Decision Analysis. McLean, VA: Decisions and Designs, Inc.
Washington: Association for the Study of the Cuban Economy, p.313329. Edlestein, Joel C. 1995. The Future of Democracy in Cuba. Latin American Perspectives 87, vol. 22, no. 4, 7-26. Gonzalez, Edward and David Ronfeldt. 1994. Storm Warnings for Cuba. Santa Monica, CA: RAND. Hunter, Douglas E. 1984. Political/Military Applications of Bayesian Analysis. Boulder: Westview Press. Lowe, Adolf. 1965. On Economic Knowledge Toward a Science of Political Economics. New York: Harper and Row. Mesa-Lago, Carmelo. 1993. “Cuba’s Economic Policies and Strategies for Confronting the Crisis.” In Cuba After the Cold War, ed. Carmelo MesaLago, 197-251. Pittsburgh: University of Pittsburgh Press. Pindyck, Robert S., and Daniel L. Rubinfield. 1976. Econometric Models and Economic Forecasts. New York: McGraw-Hill. Ritter, Archibald R. M. 1993. “Exploring Cuba’s Alternate Economic Futures.” In Cuban Studies 23, ed. Jorge F. Pérez-López, 3-32. Pittsburgh: University of Pittsburgh Press. Sanguinetty, Jorge A. 1994. “Monetary Dualism as an Instrument Towards a Market Economy: The Cuban Case”. In Cuba in Transition — Volume Washington: Association for the Study of the Cuban Economy.